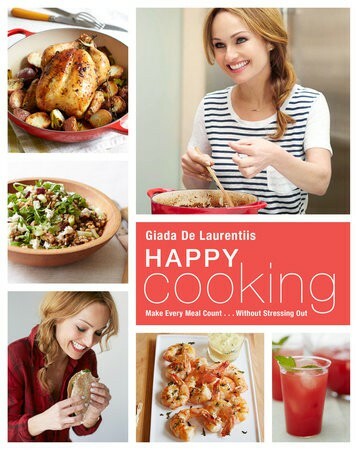 Anyone who knows me, knows that I am a huge fan of cooking shows and Giada is one of my absolute favorites so I was really excited to be able to review her new release, Happy Cooking. At first glance, the recipes in Happy Cooking are very simple dishes to prepare. The book is meant to help you find a balance between your busy life and making healthy, yet delicious recipes with ingredients you likely already have on hand. With over 200 recipes, there is no shortage of inspiration here. Granted, not all are vegetarian or vegan, but many are easily adaptable. For instance, in recipes that call for beef, I use portabello mushrooms and recipes that call for tuna, I use chickpeas. You just have to get a little bit creative. The book itself is very well put together. It is a nice sturdy hardcover with over 300 beautifully photographed pages. Giada provides tips and techniques from hosting a get together to preparing a perfect pack along lunch. I have made several of Giada’s recipes and they always turn out consistently good. The instructions are clear and offer something for everyone, from the experienced chef to the complete novice. Some of my favorite recipes from Happy Cooking include Orecchiette with Cauliflower and Breadcrumbs, Superfood Fudge Torte (just sub the egg out for egg replacer or 1/4 C applesauce) and Spiced Kabocha Squash Risotto. I could go on and on.